Save for the small Windows Phone sign under the HTC logo on the back, HTC One (M8) for Windows is a carbon copy of the Android version. As a matter of fact, you can easily mistake the two devices when looking even at their lockscreens. Being a twin to one of the best looking Android smartphones at the moment bodes well for the newly announced smartphone. Close to six months after we got to see the M8 with Android for the first time, the handset is still one of the best-looking pieces of hardware out there. We must admit that the Window Phone 8.1 user interface looks right at home on the gorgeous 5" 1080p display of the device. Design pundits might even argue that the tiled UI is an even better fit for the metal handset than competing Android OS. Unsurprisingly, the HTC Dot View case is also compatible with the M8 for Windows and features similar functionality. Cortana can actually operate while the case is closed and will output information on the case itself. 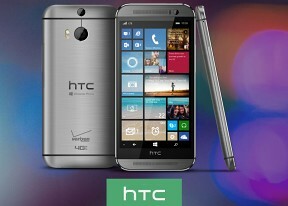 Overall, despite its highly familiar design, HTC One (M8) for Windows is set to be a highly capable alternative to Nokia's high-end Windows Phone lineup. Low camera pixel count aside, the smartphone is better than its rivals from Microsoft in terms of both looks and hardware.